Let all karma be wiped out and the mind-flower bloom in eternal spring! This April I’ll be returning to the wide-open prairies of Holy Wisdom Monastery in Madison, Wisconsin to observe the flow of spring amid the stillness of Zen. All levels of practitioners are invited to join this weekend of seated meditation (zazen), walking meditation (kinhin), chanting, and Dharma talks. Holy Wisdom Monastery is less than 10 miles outside of Madison. This ecumenical center welcomes visitors with inspiring views, comfortable rooms and lovingly prepared meals. It is the perfect place to come alive again. A practitioner at a meditation retreat asks a question. Q: What am I practicing here that helps me be more present and connected in my daily life? A: Here, what you’re practicing is presence and connection, so that you can be more present and connected. Although right now you’re in a different place doing something different than usual, this really is your daily life. Yours alone. Even among all of us gathered here in one place, no one else is having the experience that you are having. Furthermore, if I were to tell you that practice is transactional, that if you sit like this you’re going to have a certain wonderful experience in your other, “normal” life someday – that would be a lie. This isn’t a transaction. Practice isn’t a product, a course of study or a life hack. There are not two things: your life and your practice. They are the same thing. You never leave your life, and the point is to never leave your practice. It’s all one thing. We are here practicing being human beings. This is the practice of being a human being. In the old days they called Zen the practice of everyday life. You think, “This isn’t my everyday life. This is the opposite of my everyday life.” But nonetheless, this is your everyday life. Since the very beginning, and I don’t know why, human beings are not so good at everyday life. Unless they really practice everyday life. Can I practice handling just this moment, however it is? Because when I’m out and about in my everyday life, I’m perfectly fine until someone does something that I don’t like or something happens that I don’t want. That’s where it gets tough, and it can get tough every day. It can get tough today. This environment here is very artificial and contrived. We’ve arranged ourselves in this nearly empty room, everyone in funny clothes trying to sit still and be silent. We don’t intentionally add stress here, but you experience stress here. I promise you that in your life, you experience stress. Can you sit it out? Wait it out? Breathe it out? Refrain from involving yourself in sticky situations that you don’t need to be in? I can only speak from my own experience. At a certain point in my everyday life, I just could not handle it! I didn’t want any more of it! I tried everything I could think of to fix the problems and nothing worked. So when I finally sat down like this, it was an act of complete surrender. A sign of total failure. I’m going to have to do this on my own, I said. I’m going to have to figure out how to be a human being, with a life that has other people and things in it. That’s what we’re here to do. And why do we do it? I think it’s why we do everything. Not because we’re high-minded or religious. This is not a religion. It’s a practice. You do not worship Buddha, and you do not worship me. Let’s see for a moment if you can stop worshipping yourself. We’re here for love, because we have a capacity for love and we want to love and we want to be loved. That’s the connection. It’s not romantic love. It’s unconditional love. Unconditional love is pure presence. Here we are among strangers. It’s a good idea to find love among strangers. It gets complicated after you know each other’s names and stories. When you know all that, you might find that you can’t relate to someone else. You might not even be able to tolerate them. But here you can simply have respect and gratitude for one another. Here you can just be present with everyone and everything. It’s a beautiful practice, this practice of presence. It comes in many shapes and forms. Some people find connection on a swim team, or a cooking class, or off-road racing. And then you wonder how does that apply to life? But it does. What we’re doing here this weekend requires a very modest amount of time, compared to how long it takes to stream a Netflix series. And it is relatively painless. So ask yourself. Why am I here? Photo: The Dewdrop Sangha by Rick McCleary. This is an excerpt from an informal Q&A at one of this year’s Dewdrop Sangha meditation retreats. You can listen to the full recording here. If you don’t see the Way, you don’t see it even as you walk on it. I used to go around thinking that one day my real life would begin. That some day something important would happen. My life would become interesting and enjoyable. I would do things that mattered. My hard work would pay off, and my ship would come in. All of that would make me happy, someday. But I wasn’t seeing clearly. I was missing the picture entirely. Like someone standing in the waves, looking for the ocean. We spend a lot of time trying to see far ahead, figure it out, and plot the course to get somewhere else. But we can’t see far ahead. We can only think far ahead. Thinking far ahead is called blindness. Seeing what’s right in front of you is called seeing. Learn to see. Because now you know that all the things that are so easy to miss are the things that really matter. Sunday, Sept. 30, 9 a.m.-3 p.m. It is important that you encourage yourself to keep starting over, to keep listening to the basic, simple instructions in how to sit, because this is a simple thing to do. But, of course, it isn’t easy. You are here to face yourself. We are each uncomfortable in some certain way with ourselves and with our lives. Now you are here. You are sitting on your cushion and you are by yourself. You are experiencing yourself. You are breathing your own breath. The most important part to keep in mind is the body. I suppose you might think this is a thinking practice— because we always think that things require thinking—but this is a practice that ultimately requires no thinking. Your body, functioning by itself, requires no thinking. That’s why we can rely on it to guide us. Let’s pledge to practice with the body we brought. Don’t be critical. Don’t think that you are shortchanged or shorthanded, that you don’t have the right kind of feet or knees, hips, shoulders, eyes, ears, nose, tongue, body or mind. You are perfectly endowed as a buddha. What do you think? If this practice was good enough for Shakyamuni, is it not good enough for you? Two years ago we took a summer vacation to Hawaii. Nowadays weather is unpredictable all over, and here it was unseasonably wet. Roads flooded and bridges washed out. One day the clouds lifted. Housebound and bored, we signed up for a kayaking tour that would have us paddling up a river and hiking to a waterfall. The guide told us that because of the rain, this was the first day in a week that any boats had gone out. When we launched, the river was wide and placid. About two miles in, we pulled out to start the hike. They gave us sandwiches and cold drinks for a picnic in the shade. Then they told us that to start on the trail, we had to cross a ford over slippery rocks in high water with a churning current by holding onto a rope. We’d have to do the same on the way out. There was no way around it. For some of us, this is where the fun stopped. I spent last weekend sitting with a group of people in Cincinnati. Anyone who has ever been on a meditation retreat knows that the principal reason you come to sit, whether you realize it or not, is because life is difficult. Sure, meditation helps you focus and calm down. But no one with a half-opened eye comes to Zen just to chill out, be a better person, or get more out of life. This was never clearer to me than when folks began to tell me their troubles. Inside this silent room, amid a rainbow of stained glass, illuminated with the dappled daylight of the glistening garden beyond, disease was spreading, surgeries were pending, marriages were ending, parents and partners had perished, children were stumbling, money was scarce, worry was rampant, and fear flooded our hearts. The sky was falling and the earth was burning. Up ahead, the current was swirling. Knowing what we know—the swiftness of change—and what we don’t—the miles of uncertainty ahead—how do we live? There’s a rope over the river and we cross it together. The rope is love. Take it. Sunday, July 15, 9 a.m.-3 p.m.
I’ve added a one-day beginner’s retreat on Sunday, July 15 in case you need a sip of stillness in your summer. All the information you need to register is right here. How do we find joy amid chaos? I’ve been practicing meditation for 25 years now, and this question tells you why. It’s why I do retreats as a student, and it’s why I offer them as a teacher. Each of us, no matter what the circumstances, can find ourselves in a daily struggle to stay sane. And if not completely sane, at least positive. And if not totally positive, than at least moderately hopeful. There is so much going on. We can’t catch up or get ahead. Even our kids are too busy. Everyone is stressed, pressured, and anxious. The outlook is for more of the same. We may feel an urgent need to slow things down, or a depressing belief that nothing we do will make a difference. We might think that chaos is a unique feature of our 21st century culture, but that isn’t so. True, technology means that we can work 24/7, and we have our devices to thank for our chronic distractibility. We may lack the support of family and friends, and feel disconnected from meaningful relationships. But I bet that you don’t need to look very far back in your family history to find a time when your own ancestors struggled just to maintain adequate food and shelter, or labored under catastrophic wars, disasters, and economic or social injustice. In short, life has always been hard, and often a lot harder than it is now. The proverbial “simpler time” we yearn for might not have been simple at all. Contemplative practices such as meditation originated many thousands of years ago and haven’t changed. They don’t need to change. They don’t need to be modernized or adapted to the millennial mindset. They depend solely on oneself. And they work. This is what I have observed in my own meditation practice: stillness and silence bring peace, and from that peace springs radiant joy that you can experience for yourself. It begins in chaos. Are you troubled, confused, anxious or overwhelmed? You’ve taken the first step to joy. All spiritual practices are born in chaos — the shock of loss, the pain of despair, the sobering certainty of old age, sickness and death — the recognition that time swiftly passes and you are not in control. When the world is moving too fast, we always have a choice: to be tossed about by external events, or to center ourselves in the midst. The fact is, you’re upset. Frustrated, disappointed and annoyed. Resentful, regretful or indignant. Uncomfortable, uneasy and afraid. Most of us have developed a hard outer edge: the edginess that comes from resisting the way things are. Once you recognize what you are holding on to, you can drop it. It’s a lot of work to haul that extra stuff around, and it makes you feel terrible. No longer struggling against anything, you might instead feel . . . tired, very tired, and tender, very tender. Your heart softens, and you feel genuine compassion for yourself and others. Everyone is simply doing their best. This is a key step on the journey, because now you are courageous enough to do the most difficult thing of all. A great teacher once said, “The effort of no effort is the hardest effort of all.” Using breath as a guide, meditation draws you into the still center of your being. You can stay, rest, and relax there. Your core of stillness, which is pure presence, is the place where healing and transformation occurs. Some people approaching their first retreat think that keeping silent will be the biggest challenge for them. I always remind folks that silence is not a prohibition. It is instead an invitation to enter the silence that is already here. Once the mind is quieted and the heart is calmed, everything is exactly as before, but without the noisy rat-a-tat-tat of our judgments. Inner silence harmonizes with all outer activity. In silence we find quiet joy and gratitude for our life, and for all those who share it with us. What a useful thing to bring home from retreat. Perhaps you could find out for yourself. Join me at Still Summer: A Zen Retreat in Ohio the weekend of July 5-8 in Cincinnati. Last weekend I sat in a meditation retreat with a beautiful group of people. Three were in pain from back injuries. Two had recently lost close members of their family. One had a chronic illness; another, cancer. Others were facing vexing uncertainty in employment and finances. Several were overwhelmed with the care of elderly and incapacitated parents. Our youngest participant, a 20-year-old college student, said that because she has difficulty managing her attention and anxiety she was pretty sure she was doing it all wrong. In short, we were exactly alike, doing what we needed to do in the only place we could be. My doctor’s office called a few weeks ago saying that I was overdue for a physical. My last visit was in 2016. How had a whole year disappeared? I knew how. The year had vanished in a lethal flurry of hurricanes and floods, fires and mass killings. It was swept away in a cyclone of fear, behind a wall of rage. It was crushed by greed, ignorance and ineptitude; infected with hate; buffeted by chaos; and pounded by gale-force lies. Oh yes, I understood why I might have lost track of normal. The world—with me in it—was sick and on life-support, in organ failure, beyond medical intervention. The family had been called in to pray. At the beginning of every retreat, we set out a blank sheet of lined paper with the title “Sick List.” Everybody is invited to write the names of people to chant for who are sick or suffering, that is, anyone other than themselves. The trick to wellness, you might know, is to see beyond yourself and your sickly preoccupation with your own fear, pain, inadequacy and sorrow. Only then can you see what to do. At first, the names appear slowly, a dozen or so, the people and pets we know for certain are worse off. Their names are chanted in our morning service. Then, in the mounting hours of silent stillness, our hearts soften and we think of many more. Now there are two dozen names on the paper. We might recall those people we didn’t think we could help, or even want to. Difficult people, distant or estranged, overlooked and then suddenly seen in a sympathetic light. Three dozen, four, five. Spoken, the names flow like a spring river over two sides of two pieces of paper, and fill the room. Little by little we let everyone into our warming hearts until the last day, when we arrive at a great and humbling truth: that as soon as we stop thinking about ourselves we are one piece with the entire world and everyone in it. No one is left out or forgotten; no one remains unworthy or unloved. And then we can’t help but smile, because we are not sick, we are well and whole. The way I see it, if the greedy, angry and ignorant can unleash this much evil in the world, each of us, by our own selflessness, can deliver this much good. When folks begin to practice Zen, they can be set back by how hard it is. They might have expected to be good at it—for certain they expected something—but what they are good at is something else altogether. Why is it so hard to just breathe? Because you’ve been practicing holding your breath. Why is it so hard to keep my eyes open? Because you’ve been practicing falling asleep. Why is it so hard to be still? Because you’ve been practicing running amok. Why is it so hard to be quiet? Because you’ve been practicing talking to yourself. Why is it so hard to pay attention? 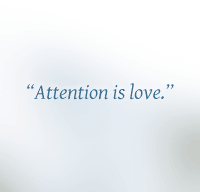 Because you’ve been practicing inattention. Why is it so hard to relax? Because you’ve been practicing stress. Why is it so hard to trust? Because you’ve been practicing fear. Why is it so hard to have faith? Because you’ve been trying to know. Why is it so hard to feel good? Because you’ve been practicing feeling bad. Whatever you practice, you’ll get very good at, and you’ve been practicing these things forever. Take your own life as proof that practice works as long as you keep doing it. Just replace a harmful practice with one that does no harm. For the benefit of those who will be practicing with me at any of these places, and especially for those who won’t be able to make it. Someday, I told myself, I was going to sit a long retreat. I signed up for ten days, but by the second day I wanted out. Midway through the sleepy dawn sitting, I slunk out of the meditation hall into what I thought would be the invisibility of my dorm room. I didn’t plan to stay away long. I would just take a short break from the aching effort of staying awake. I was a beginner, you know, doing my best, and I thought I deserved a little me time. It would be a while before I began to realize that, no matter what I’m doing, it’s all me time. A few minutes into my escape, the door opened and two staff members came in and convened an impromptu meeting right next to me as I lay mortified on my foam mattress, staring up at the ceiling. That woke me up! I couldn’t wait to get out of my getting out. At no time during the next twenty years of practice have I ever fled a sitting period, although I’ve wanted to. Of course, there are many ways to flee discomfort and difficulty, and I’ve explored just about all of them unsuccessfully. The best place to practice is a place you don’t want to be, using the time you don’t think you have. That morning I learned that resolving the great matter of life and death starts with the little matter of showing up. I showed up to the zendo every morning, every afternoon, and every evening. I showed up to sit in one spot, upright, and watched the light rise and fall overhead. I surrendered; I settled; I entered samadhi, which means I stopped running around in my head. As much. The time that followed wasn’t fast or slow. It wasn’t long or short. It didn’t come or go. When the retreat was over, I went home happy and excited, babbling about the discovery I had made. “I know what a day is!” I said to my roommate at the time. He suspected I’d been off chasing unicorns and rainbows. “It is daylight, followed by darkness, followed by daylight!” He looked at me funny. Maybe these retreats weren’t such a good idea. I was trying to describe what I’d seen: a day has no beginning and no end. It goes on forever. Conditions change, that’s for sure. The light shifts and the breeze moves; the temperature goes up and down; people are born and they die; the pages on a calendar flip; the second hand sweeps; toenails grow and hair falls out; but time itself stands still. There is no greater joy than seeing through time, because then you’ve touched the leaf tip of eternity, which looks exactly like your backyard right now, overgrown with time. Where else could it be but right here now? Excerpted from Paradise in Plain Sight ©2014 by Karen Maezen Miller. Printed with permission of New World Library, Novato, CA. How do you know if you are prepared to handle the silence, the stillness, the discipline, and the single-minded focus of a meditation retreat? Relax. You can’t know. You don’t need to know. There is no way to prepare. The very notion of preparation traps us in false expectation and self-evaluation. It shows us how often we are paralyzed by the feeling of inadequacy in our lives. We are never inadequate but we are immobilized just the same. A Zen retreat, which is the only kind of retreat I’ve experienced, is designed to cure you of that paralysis. It is intended to rid you of hobbling second thoughts and hesitation. I like to tell people to leave preparation aside and just bring readiness to a retreat. Readiness is no small thing. It can be quite compelling and even desperate, but it does not require preparation. 1. The organizers will tell you when to come and what to bring. Follow those instructions to the letter. It is good practice for a retreat, which consists entirely of following instructions. 2. Find a pet sitter, a house sitter, a babysitter, and every other kind of sitter you think you need in order to leave home and its responsibilities completely. You are creating a trusted community to support you in your ongoing practice. Reliable surrogates may not relieve you of anxiety, but they rob you of excuses. 3. You may be inclined to read about retreats before you attempt one. This is natural, but it’s not such a good idea. You are bound to form erroneous preconceptions about what you haven’t yet experienced. I read Robert Aitken Roshi’s Taking the Path of Zen before my first retreat, and of all the books I read it helped me to prepare the least. 4. Leave all books at home. Books aren’t the subject of retreats, so you’ll only be discussing it with yourself, probably on the cushion. Not helpful. 5. Leave your laptop, your tablet, your every little ringing thing behind, or just turned off. (Except bring an alarm clock!) You are without a doubt central to the universe, you just aren’t all that important. Your retreat will be richly enhanced if your keypad is out of reach, so you’re not tempted to live tweet your retreat or Instagram your sudden enlightenment. In this way you can see how the dharma works by itself when we truly commit ourselves to doing nothing, not even Facebook. 6. What’s holding you back? Pack your fear in your suitcase and bring it along. You won’t need it, and next time you’ll be unafraid to pack lighter. In practice centers everywhere, summer is retreat season. What’s still on your mind? Leave it out of the suitcase.